The PF police have now blocked the planned meetings and tour of the Copperbelt province by opposition UPND leader Hakainde Hichilema. In the continued effort to suffocate and eliminate opposition politics in Zambia, the PF have instructed that Mr. Hichilema should not be allowed to hold meetings and market tours on the Copperbelt. Sources within the UPND have said that Mr. Hichilema was due to receive defectors from the ruling PF and other parties and also hold meetings with UPND officials this Thursday as well as fundraising ventures, but the meetings have been blocked for ‘security reasons’. UPND sources said the Copperbelt tours were part of the UPND strategy of party mobilisation and re-organisation, but the PF government felt the UPND leader was going to incite people in the area to rise against government over mealie meal and water shortages as well as power black-outs in the area. Mr. Hichilema was also scheduled to hold meetings with traditional leaders on the Copperbelt rural as well as farming communities in the area. 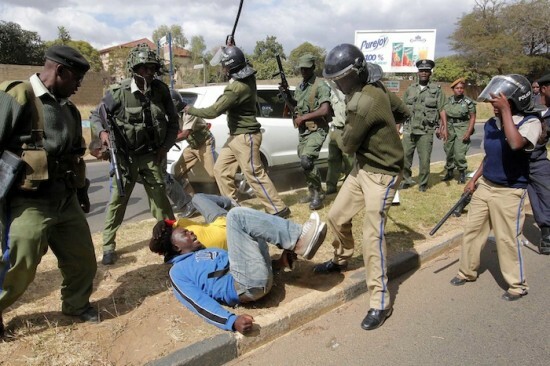 The UPND says other than the PF police instructed to block meetings and tours of markets in the area, the ruling party thugs have been instructed to violently stop Mr. Hichilema’s meetings and tours. Two months ago, opposition MMD were also blocked from holding rallies on the Copperbelt for security reasons even before the current mealie meal shortages in the area. Civil society and church organisations that were previously compromised by the PF government have all condemned the systematic elimination opposition politics in the country using archaic laws such as the Public Order Act which the PF have embraced, yet they condemned it while in opposition. Law Association of Zambia (LAZ) have so far sought for judicial intervention on the matter. However, early this year, a planned UPND Kanyama rally was blocked by Police despite a court order that allowed the rally to go ahead.